1. Put the chillies, ginger, garlic, shallots and sugar into a mortar or a food processor and blend to a coarse paste, adding a little of the tamarind water if necessary. 2. Cut open the body pouch of the squid along one side and, with the tip of a small, sharp knife, score the inner side into a fine diamond pattern. Cut the squid into approximately 3cm squares. 3. Bring the chicken stock and the rest of the tamarind water to the boil in a pan. Add the spice paste and simmer for 10 minutes. Strain through a muslin-lined or very fine sieve and bring to the boil again. 4. 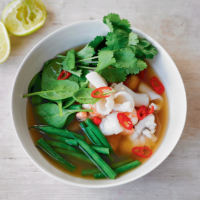 Add the Thai fish sauce and the beans and simmer for 1 minute, then add the monkfish, squid and prawns and simmer for 1 minute more or until the fish is cooked through. Tip in the spinach and simmer for a further minute. 5. Ladle the soup into warm bowls and serve scattered with coriander sprigs and red chilli, with a lime half on the side for squeezing over. Cook’s tipTo make tamarind water mix 2 tsp tamarind paste into 100ml water.